I had a Superman moment the other day. I was sitting in a diner with a bunch of tech geeks after Microsoft’s Kinect show at E3 in Los Angeles and saw a guy at the counter playing with some kind of good looking tablet device. I knew it wasn’t an iPad – it was too small. I broke up the conversation at the table, saying, “What is that?” Everyone turned around and looked. The first question was “you mean the pie?” Then they noticed. “It’s an iPad!” I shook my head no. “It’s a Kindle!” Nope, wasn’t white. “It’s a Nook!” Maybe, we thought, so finally someone got up and went over to interrupt the guy’s dinner. We were all wrong – it was a Moonse. What’s a Moonse? A Moonse is a 7″ Android table runs Android apps, weighs nothing and costs $169. Yeah, we were all awestruck too. 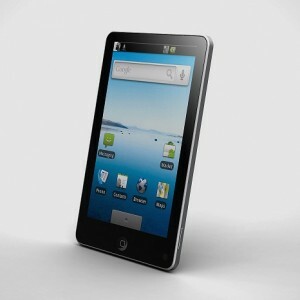 The makers of the Moonse is a Chinese company called Shenit, and they currently offer four Android tablets – three of which are 7″ devices (the cheapest of which is only $119, pic below) and the other an 8″ device for $239. Shenit will ship these devices anywhere and has a full store setup with Paypal, etc. The guy in the diner said he didn’t have any problems getting his. The tablets run Android 1.5/1.6 and have SD slots, two USB ports on the Moons, audio jacks, an accelerometer, a front-facing camera and a single iPhone/iPad like navigation button. The reviews on shenit.com point to not good battery life, so this might not be an out-all-day device, but for less than $200, it could be a very nice device to play around with Android and to use around the house as a supplement/alternative to an iPad. There are of course lots of iPad knock offs coming and out there, but this is one you can order and have shipped to you right now (shipping to California takes a week and costs $25). Here’s to cheap Chinese products!